The translite above shows a great set-up of the four Star Wars Popsicle wrapper flavours. Han does not look pleased about being Raspberry…. The next image is another translite of the original art used on the front of the Peters / Pauls infamous Jedi Jelly ice-creams. Followed by a hurried 🙂 shot of another major element of the box art, the actual ice-cream! And a translite of the completed product and wrapper! I’m indebted to a very special Toltoys.com contributor from Queensland (who knows who he is!) for all of these great images, thanks mate! 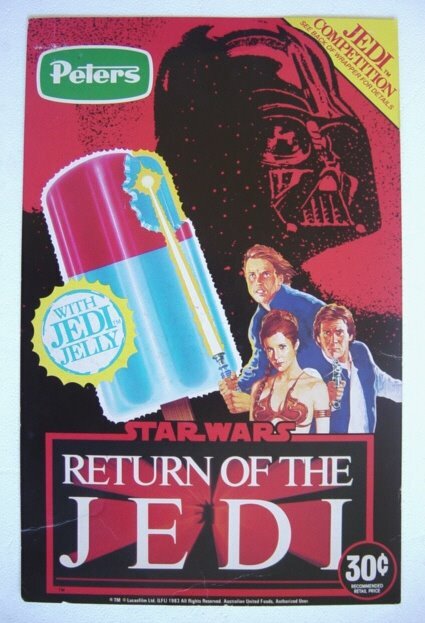 thats pretty cool, I dont remember the tip-top R2-D2 popsicles, but I do remember the ROTJ Jedi Jelly ice creams, they were Good! I used to hound my Mum to by the Ice Creams just so I could get those stickers. They were then stuck all over my school books and desk. Fantastic time to be a kid. Ah 1977, a great year. 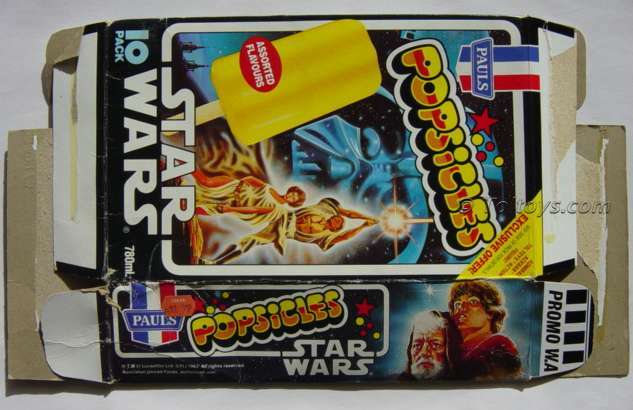 Streets had a Star Wars icy-pole around 1977-78: strawberry and pineapple, same shape as the Polaboy and Paddle Pop.